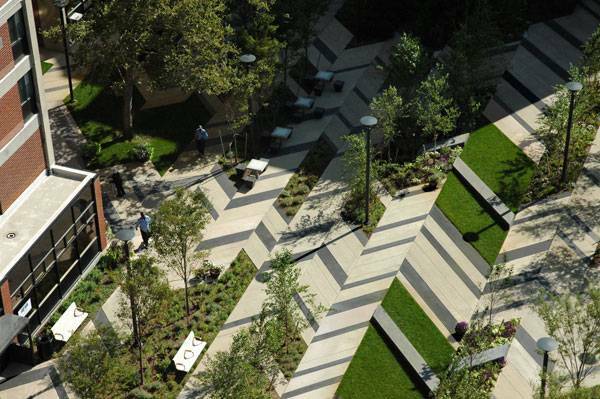 Levinson Plaza, Mission Park, Boston, Massachusetts, USA, by Mikyoung Kim Design. 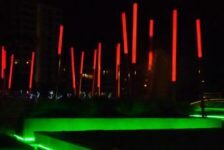 A city plaza is more or less like an urban jungle where people can unwind and get in touch with their inner naturalist. Maybe they do not even know that they secretly admire nature in this mechanized world. 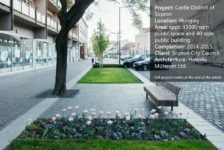 But a plaza in the midst of busy roads and lanes has always attracted people of all ages and has helped people to unveil that secret. 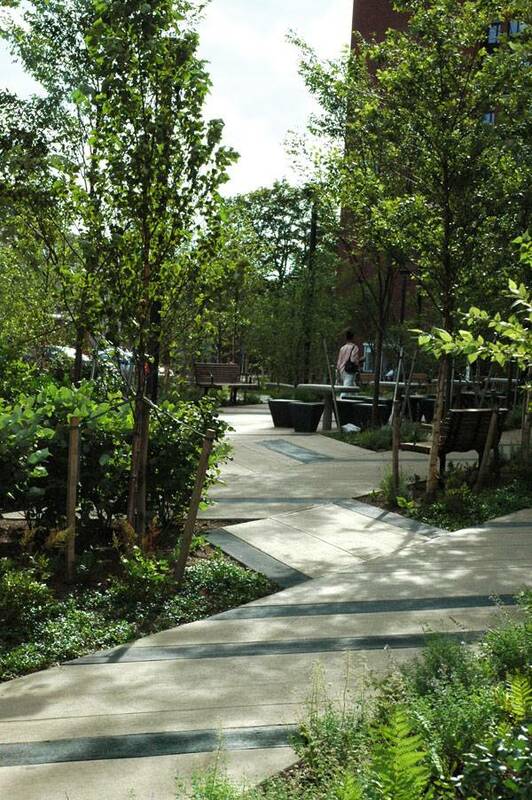 Located on what had once been a raised plaza that was largely exposed to the traffic and train congestion of nearby Huntington Avenue in Boston, Levinson Plaza in Mission Park was redesigned to shelter it from the nuisances of the busy thoroughfare and to satisfy the need for a children’s play area, a community gathering space, recreational spaces, and other multi-programmatic activities for nearby residents. 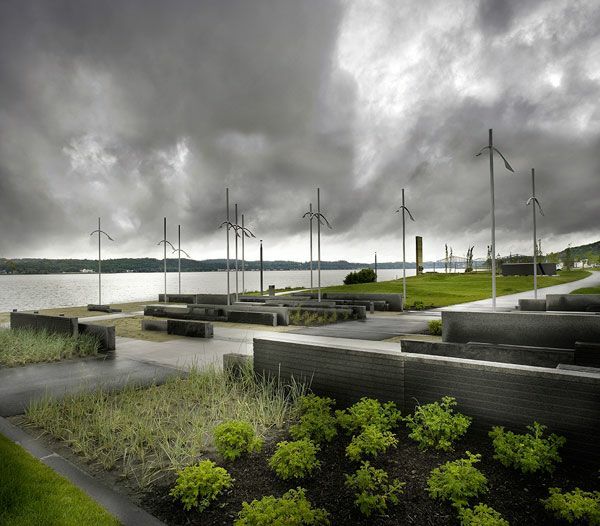 Mikyoung Kim Design designed the new urban plaza, creating an urban park and a green refuge in the city. 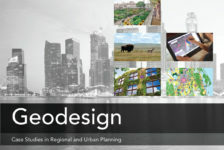 Levinson Plaza by Mikyoung Kim Design. 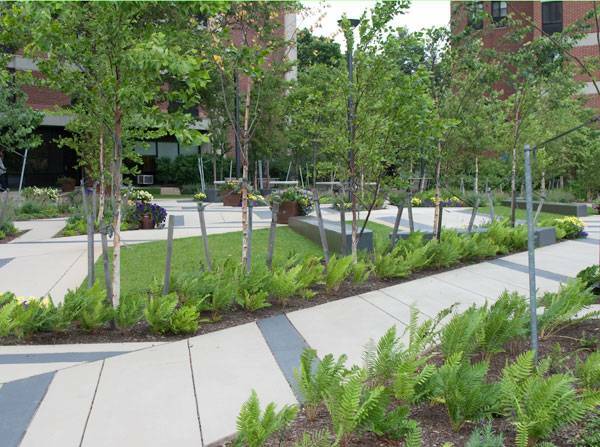 Easily accessible to all, the design team planned the plaza as an urban grove to accommodate a complex program. The plaza consists of lawns, canopy trees and different types of textured plant species, contemplative seating areas for different groups of people, and flexible open space to serve as venues for large gatherings during festivals such as the Chinese New Year, Russian Unity Day, and other cultural and civic events. The seating areas are designed thoughtfully and creatively. There are different sorts of seating arrangements. 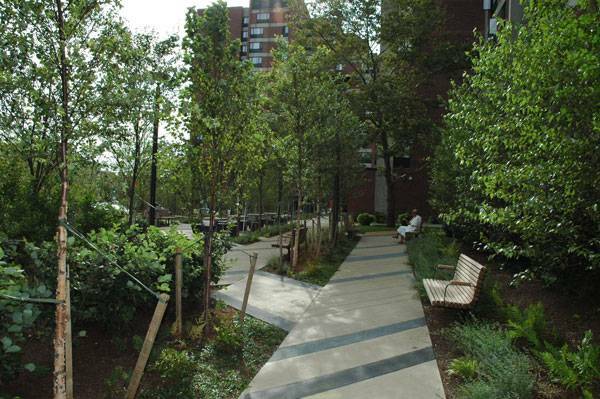 One is the bench type just beside the textured, flowering plants shaded by canopy trees. 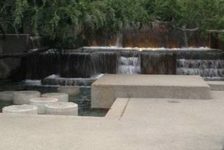 This type of seating is for people to admire nature and to enjoy their time in solitude. Another sort is the ones that can serve groups of people playing games such as Tai Chi and chess. The Herringbone Pattern The strong, graphical pavement pattern is what makes this project stand out from others. 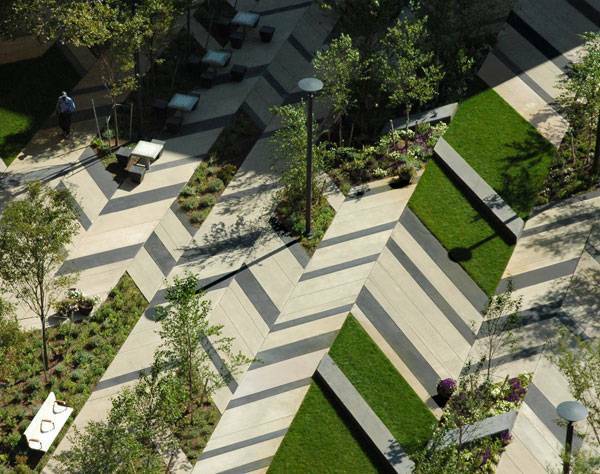 The herringbone pattern concept is derived from the regional garden landscapes of New England. The lawn areas, often used for sunbathing, are carved out diagonally from the pavement to preserve a seamless pattern, while the paved areas within the garden are carved out of the grove to allow for direct access to major entry points and public transportation. Throughout the 30,000-square-foot project, the pavement pattern seamlessly stitches together the areas of gathering and circulation. Choice of Plants Thus, the architectural team chose from the rich palette of plant species very meticulously. 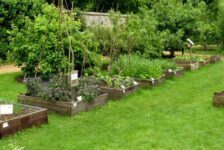 Plant species of various sizes, from canopy trees to hedges, are organized in different layers. These layers filter these urban conditions while maintaining privacy and views for safety throughout the space. Although the densely planted canopy trees imitate the aspect of a grove, I think the linearity in their organization gives an expression of rigidity to some extent. Instead of maintaining the strong geometrical lines, an approach to break the linearity would have given a more flexible and natural look. The plant species vary from hedgerows of River birch to Zelkova. 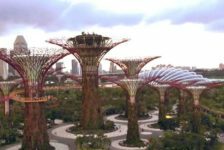 This palette of plants was chosen because it can withstand the demanding conditions the city provides — high winds, winter salt applications, poor soil conditions, and high ranges in air/soil temperature. The choice of the combination of hues, starting from the pavement patterns to that of plants and trees, is extraordinary. The use of subtle colors complements each other gorgeously. 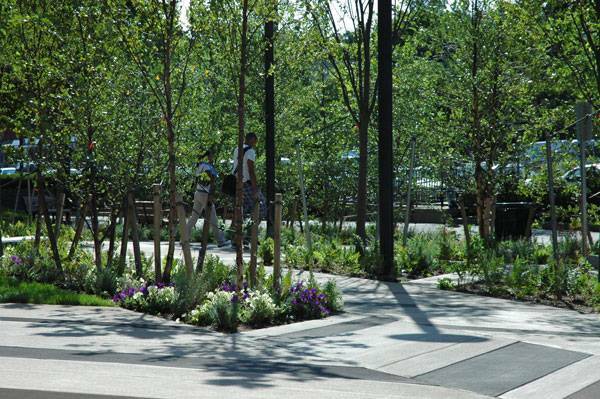 The combination of the cream and gray colors of the pavement patterns with the green trees appeals to all. Besides its aesthetic qualities, the durability of pavement materials is also considered. 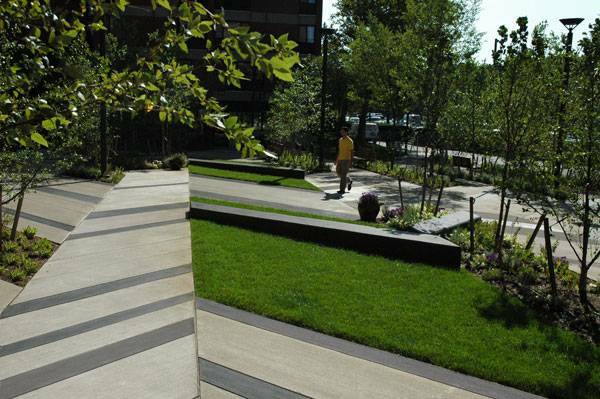 The designers used pavement materials that are durable, require low maintenance and withstand Boston’s long, challenging winters. 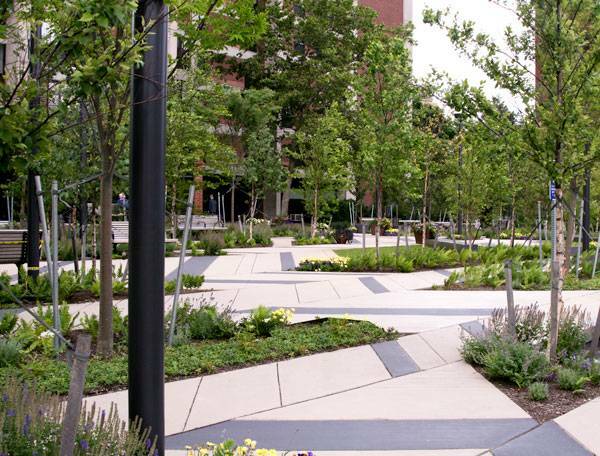 Overall, the success of the plaza lies in filtering out the urban conditions, satisfying the community’s demands by creating a place that gently transitions from busy city streets to a quiet, intriguing space. 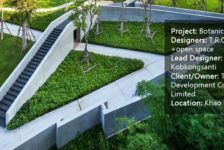 In doing that, it has once again reminded us of the capabilities of plants as natural landscape elements and has also taught us how even the simplest features, such as a change in pattern, can bring uniqueness to a project.